Add oil to a kadhai, when hot add whole garam masala and let it fry for a minute. Then add onions and saute them on medium flame until soft and transparent. Then add ginger-garlic paste and cook for 2 mintues. Later add turmeric powder, red chilli powder and stir and cook for a minute. Then add the tomato puree and cook till oil separates from the gravy. 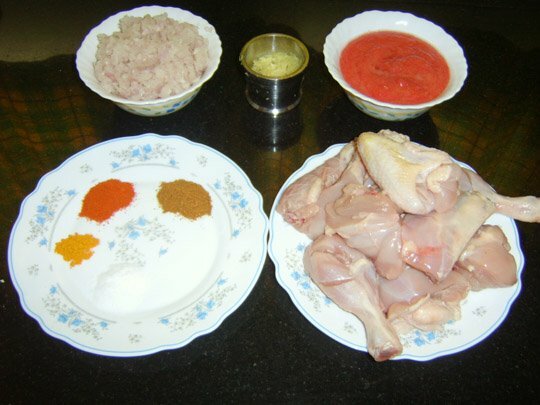 When tomato is nicely cooked, add chicken pieces, mix well, add some amount of water to prepare the curry and then cover and cook till chicken is tender. Then uncover and add chicken masala and salt, stir and again cover and cook for 2 minutes. Garnish with coriander leaves if you like and serve hot with rotis or parathas.